Everyone in her family pitied Tina Maharjan when she was afflicted with polio. 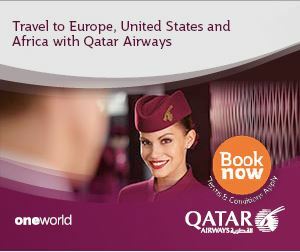 But disproving the notion that disability is a burden only, she established herself as an accomplished basketball player. “Living with polio was a curse, but it is not anymore,” says the 29-year-old, who has had polio since she was one. She couldn’t crawl properly, but her parents took her to shamans instead of a hospital. That delay made her infantile paralysis worse. 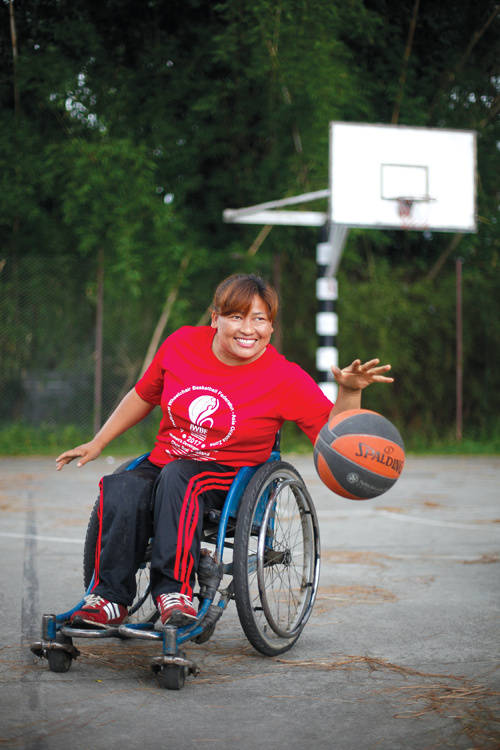 She is one of eight polio-afflicted players among 40 female athletes playing in the wheelchair basketball league organised by ENGAGE, a Kathmandu-based NGO, supported by Turkish Airlines and the Swiss Embassy. The finals are slated for 1 July at the Nepal Army in Lagankhel. (See box). Tina is already captain of the Wheelchair Sports Association females club, and to date has won five gold medals. She credits her husband for his encouragement. “I am the only person with a disability in my family, but that doesn’t make any difference,” she says with a bright smile. 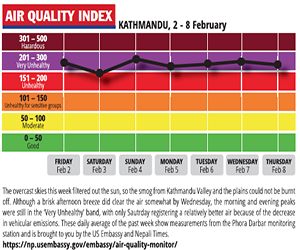 Nepal was declared polio-free in 2014, and 90% of children are vaccinated against the disease every year. Pakistan, Afghanistan and Nigeria are the only countries where new cases of polio are still being found. Sarita Thulung was also infected with the poliovirus when she was three, and crawled back and forth to school even though her parents discouraged her. She completed college and started a handicraft business. Today she is a national basketball player. Born and raised in Sarlahi, Sarita was ostracised by her family and relatives for having the disease, which they believed was the curse of an evil spirit. But after finishing her studies, she came to Kathmandu and ran her own business to support her family in the Tarai. Simone Galimberti of ENGAGE says his group wants to raise awareness about disability through sports, and hopes to improve the standard of wheelchair basketball in Nepal with the championship. Most of the 120 players fell from trees while gathering fodder, or were injured in accidents. A third of the players are polio-afflicted. They are the last generation of Nepalis with polio. 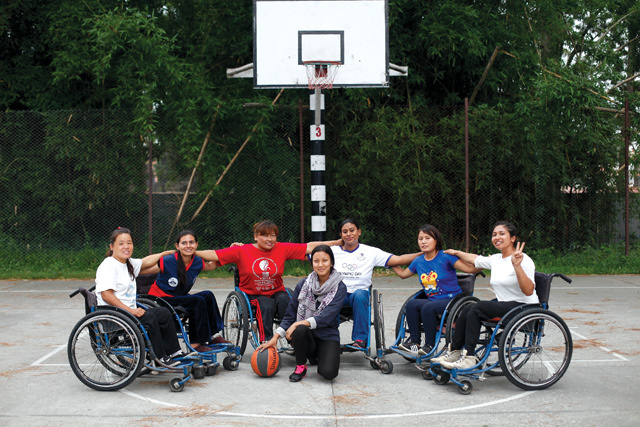 Wheelchair basketball is gathering pace in Nepal thanks to a tournament organised by a non-profit that promotes social inclusion. The second ENGAGE Empowering League is being held at schools in Kathmandu. Ten teams, six male and four female, are vying for a spot in the finals to be held at The Army Physical and Sports Training Centre on 1 July. Jawalakhel Wheelchair Sports Club and Tribhuvan Army Club will play in the men's finals on Saturday, and Wheelchair Sports Association and Nepal Spinal Cord Injury Sports Association will go head-to-head in the women’s category.